At nearly 7-feet tallSamuel Dalembert is used to standing out in crowd but Friday night he was standing out for another reason. The Sixers center donated $100,000 to UNICEF’s relief efforts in earthquake-ravaged Haiti. Dalembert is the only Haitian born player in the NBA and his father still lives there. Luckily Dalembert’s dad is OK but he still was worried about other family members as well as his country as a whole. 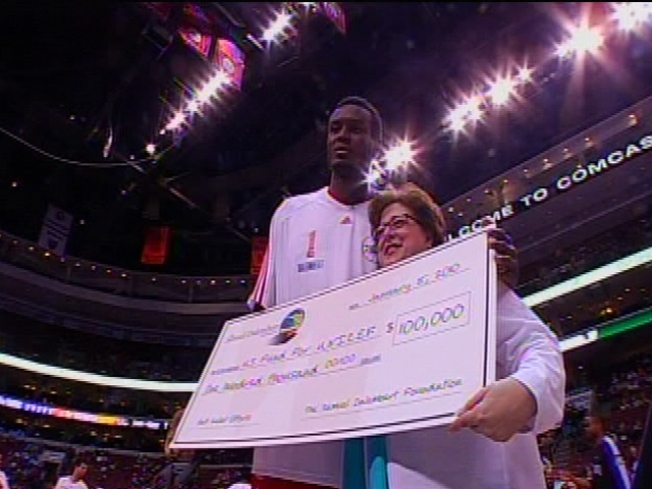 Dalembert would also match any money raised by UNICEF at the Sixers game Friday night. He also planned to play again Friday night with a heavy heart. He played Wednesday just a day after Tuesday’s quake and responded with a 21-rebound performance. “I couldn’t let my guys down,” explained Dalembert. One place he has tried to never let down is his native land. Giving to Haiti is nothing new for the nearly 7-footer he already contributed more than $70,000 to Haiti through his foundation. He continued to ask for donations through the Samuel Dalembert Foundation Web site. To make sure the message of help needed made it to the masses, Dalembert also taped a public service announcement for UNICEF encouraging fans to contribute anything they could. The league wanted to make sure that Dalembert’s contributions wouldn’t be the only money coming from pro basketball. The NBA and its players' association would contribute $1 million to support the relief efforts in Haiti. Dalembert was also trying to get permission to go to his native country to help out in any way he could.